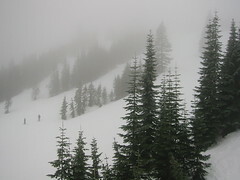 Yesterday Markus and I went snowboarding at Stevens Pass. I picked him up in the morning at SPU and headed up for some father/son snow carving. We had a good time together, but the conditions were less than ideal. The snow wasn't too icy, but there was a band of clouds that hung on the mountain all day. Visibility is important when you careen down a mountain! The crowds weren't bad and we put in a full day. Markus broke in a new pair of bindings, and I wore out an old pair of legs.